Azuki Bean Pound Cake - Do You Know The Muffin Man? Notes: My approach to recreating a wonderful cake I had in Japan has been to look for recipes using chestnut paste and then substituting azuki bean paste. 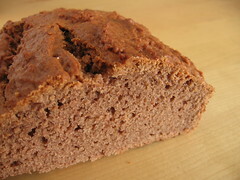 For this pound cake, I replaced the sweetened chestnut purée with koshian, and added two tablespoons of cocoa powder. While the cake was quite nice, with a fine delicate crumb, it tasted neither of azuki bean nor chocolate. I'm guessing the butter is overwhelming the other flavours; indeed, the ingredient list from Toraya doesn't list any in their cakes.